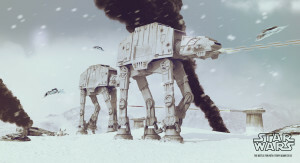 This is a current work in progress, an imperial at-at (all terrain armored transport) from Empire Strikes Back. My favourite of all the Star Wars movies, I must have watched this over 50 times :). One of the most striking images was, early on during the battle for the ice planet Hoth, these behemoths lumbered across the snow plains, advancing on the rebel base. Some of the snowtroopers were on speeder bikes, rebel fighters desperately trying to take these things down, and that’s the scene I want to recreate. All modeling in 3D Studio max. I took some liberties with the texturing, as I can’t help myself and I have to add rust and weather, but it makes sense in context of a snowy, wintery planet (the original models animated by ILM were not as grungy as this). The snow drift uses a displacement map to cause the bunching up around the feet. Lots more to add! !